News: High Court hears appeal in…. Sydney?? This may not seem like news, but it is a first in nearly four decades. 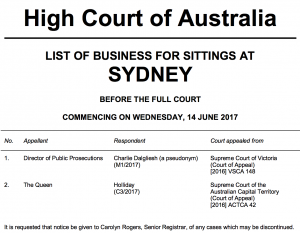 While the High Court’s Sydney Registry is often host to hearings of Australia’s apex court, these have long been limited to minor fare: special leave hearings, case management and the like, involving between one and three judges. By contrast, today’s hearings involve the Court’s core business (appeals) and at least five judges, something that last happened in Sydney on 10th and 11th March 1980, when all seven members of the Barwick Court heard a workers compensation dispute. The Court conducts its sittings in Canberra and such other places as are determined by a Rule of Court made by the Justices in the preceding year. In addition, applications for special leave to appeal to the Court are heard regularly in Sydney and Melbourne, and the Court continues the practice, established on its inauguration, of sitting in Brisbane, Adelaide, Perth and Hobart if warranted by the amount of business. So, what has changed now? One formal change is that the High Court’s annual announcement of its sittings, which once identified those sittings in advance by place and date, has since 2011 only listed dates of sittings ‘to be held at Canberra and other places as required’. It seems unlikely that today’s hearing was ‘warranted by the amount of business’, much less ‘required’, as neither appeal being heard is a NSW matter – there’s one from Victoria and one from back in the ACT – although the Court has scheduled some NSW matters for judgment. A second more recent and practical change is that the Court last year reduced the number of oral special leave hearings it holds, so that Sydney (which hosted ten special leave days in 2011) held only seven (generally shorter) ones in 2016 and is on track for five or so this year. Restoring Sydney to the High Court’s traditional ad hoc circuit of outlying capital cities could give the staff of the Sydney registry more to do as well as possibly preventing the Court’s judges from losing touch with local legal customs in New South Wales. As the Court’s Melbourne sittings are also affected, the Court may also eventually restore its former home to the capital city circuit. Victoria has not hosted a large High Court hearing since 1 April 1980, when five members of the court heard a costs dispute over failed litigation concerning the two airlines policy. There has been no announcement accompanying this apparent change to the High Court’s circuit practices, nor even foreshadowing in its annual report. (By contrast, the UK Supreme Court made much of its own decision this week to go on circuit to Edinburgh.) The Court’s lack of transparency on its policy on sittings is unfortunate, as its circuit has been a matter of controversy throughout its history, though reduced airfares have surely blunted past pro and con arguments about the costs of interstate travel. It would be interesting to hear more about the practicalities of holding full appeals in facilities that were (presumably) designed with smaller hearings in mind. (Today’s hearing is in the courtroom on Level 23 of the Law Courts Building. 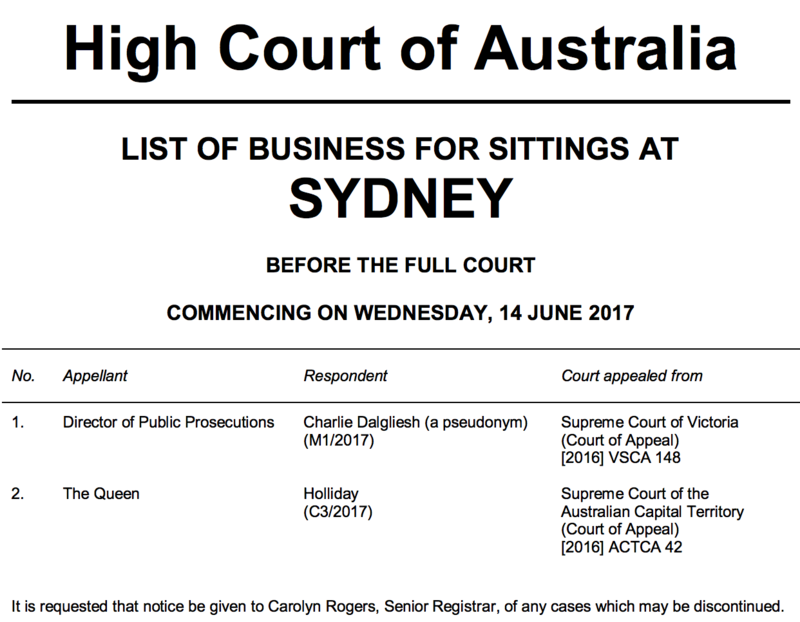 The High Court’s previous Sydney hearings were in Darlinghurst.) I’m also curious about whether and how the Court’s apparent change in its sitting practices interacts with any budgetary debates about the continuing maintenance of the judges’ chambers and other facilities in Sydney. Jeremy,I dare say the last sentence of your post is close to the real reason for the Sydney sitting.Unless they are actually sitting there on appeals,most of the judges prefer to work in their home location. Aren’t there only two (Bell and… Gageler I think) judges based in Sydney at the moment? But maybe the rest like the awesome views. I believe that works going on at the court are the reason for it not sitting in Canberra at present. Oh, a boring explanation. But what works would take out both large courtrooms in Canberra at the same time? And wouldn’t have made more sense to go to Melbourne, given that one of the two cases was from Victoria and neither were from NSW? What I gathered from speaking to Canberra registry staff when filing documents recently was that renovations to the front entrance (perhaps to install a new security checkpoint?) of the building are very noisy so the Court will sit elsewhere until the works progress to a point where the noise is reduced. Crikey. Strange that the works couldn’t be fit around the Court’s schedule, wihat with the three day weeks, two week months and lengthy winter recess just around the corner. “The High Court of Australia is unable to sit in Canberra while the High Court building’s 37 year old air conditioning system undergoes refurbishment. The Court’s August 2017 sittings will therefore be held in Brisbane and the September 2017 sittings will be held in Melbourne. Compared to 2016–17, total own-source revenue will decline over the budget year and forward estimates period due to a reduction in expected interest revenue as a consequence of using cash reserves to fund capital works, including the refurbishment of the High Court building’s heating, ventilation and air conditioning. Let’s hope they keep Barwick’s ‘ghost’.